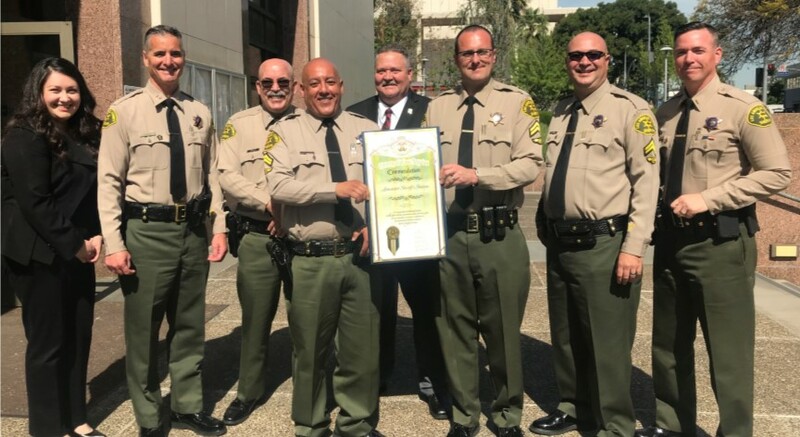 LANCASTER – Traffic investigators from the Lancaster Sheriff’s Station were presented with a commendation during the Los Angeles County Board of Supervisors meeting on Tuesday, April 9. Detectives Ryan Bodily, Matthew Davis and Gilberto Borruel were recognized for solving more than 75 hit-and-run, driving under the influence and fatal collisions in 2018. Supervisors from the five districts, as well as LASD Detective Bureau Chief Patrick Nelson and North Patrol Division Chief Dennis Kneer were on hand to commend the detectives for their care and compassion while investigating crimes. The detectives were recognized in conjunction with National Crime Victim’s Rights Week, which is celebrated every year in April. The week is dedicated to learning about the effect victimization has on individuals, families, friends and the community, and to promoting laws, policies and programs to help victims of crime. 1 comment for "Lancaster Station traffic detectives honored"